(K'JIPUKTUK), HALIFAX - Many people assume that the diet of the university student mostly consists of ramen noodles or frozen pizzas, food that can be hastily consumed in intervals between classes. Yest rising tuition fees and the increasing cost of living mean that students fueling their education face difficult decisions not only about what to eat, but how to eat at all. ‘I thought I’d give it a try’ says Keegan Irish, a King’s student who sought assistance from the Parker Street Food and Furniture Bank when money was tight, adding that he felt conspicuous standing in line. ‘We are privileged to be getting an education but I also think that a lot of students struggle financially because of student debt,’ says Ali Calladine, a student at Dalhousie who spent the summer working with the Campus Food Strategy Group, a joint initiative of the Sierra Youth Coalition and Meal Exchange. ‘I actually know many people who have trouble buying groceries every week because they’re trying to pay their tuition fees and text books and all of that,’ she says. As Nick Jennery, executive director of Feed Nova Scotia, points out, there are presumptions about the circumstances that drive people to use food banks, but in reality ‘the reasons are as diverse as the people who walk in the door’. 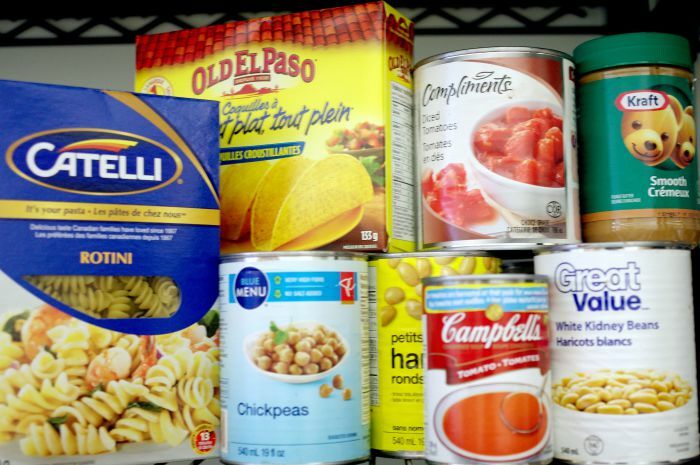 Despite a 10% decrease of household use of food banks in Nova Scotia between March 2013 and 2014, according to the Food Bank Canada’s annual national survey, Jennery cautions against seeing the drop as wholly positive. Food bank use for single people without children is up to 65% from 57% in March 2013, that numbers are up nation-wide from 2013, and that the number of those seeking food assistance hovers stubbornly at 16% above pre-recession levels. Universities across Canada offer food banks for their students, and in this Halifax is no exception. Unlike community food banks, campus alternatives require no paperwork and ask only for a student ID. Tracking student food bank use is difficult; the same ease of access designed to make the campus food bank appealing to students also means that little information is kept about who comes through the door. Fueled by supplies from Feed Nova Scotia, the Dalhousie food bank offers students with a lot on their plate an easier and on-site way to get food assistance. ‘There’s definitely unfortunately some stigma around using a food bank, but because it’s a campus food bank it’s part of the culture that we understand that students are financially burdened’ says Holly MacDonald, Members’ Services Coordinator for the DSU. Although students are relatively privileged, she acknowledges, there’s also a culture on campus of understanding that the costs associated a university education can be overwhelming. Despite the food bank’s relatively central location in the Dalhousie Student Union Building, many students are unaware of it. The politics of food on campus still leave many students hungry for change. For Calladine, when it comes to discussions about the distribution of food, students have a lot to bring to the table. Citing models such as the Loaded Ladle, which levies the student body to provide healthy free meals to students on a weekly basis, she points out that universities are an ideal location to attempt projects that would gain little traction in the broader community. With a range of initiatives including campus gardens – which donated their excess produce this year to the university food bank – to a weekly not-for-profit farmer’s market, to what Calladine hopes will be the hiring of a food commissioner through the sustainability office of the Dalhousie Student Union next semester, the university is poised to be a site for debate about how we produce and consume food, going beyond food banks to examine some of the root causes of hunger. In the mean time, Calladine hopes that the first step in a more equitable approach to food distribution is normalizing the use of food banks by all those in need, including students.